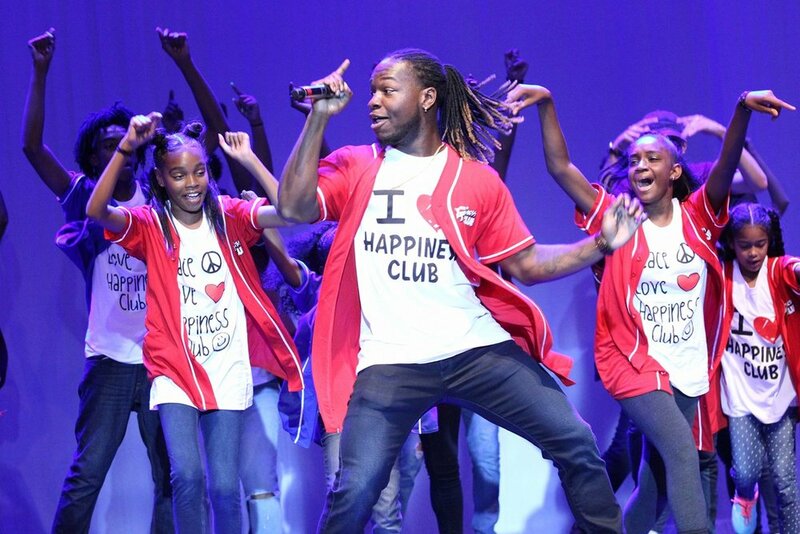 The Happiness Club is a diverse group of 40 Chicago kids who encourage positive values and social change through the creation of original hip-hop and pop music and dance. The Happiness Club's mission is to positively influence kids through the arts, to guide them in making sound decisions and to help them become role models in their communities. This is accomplished by drawing kids in through the music and inspiring them with the lyrics. From Bronzeville and Englewood to Glenview and as far as Algonquin, The Happiness Club represents all levels of income and ethnicities. The Happiness Club kids sing out against drugs, gangs, violence and bullying and say "Yes" to education, tolerance, high self-esteem and peaceful solutions. On any given day at The Happiness Club one can find a microcosm of a perfect world: teenagers helping middle schoolers learn a dance routine; kids working on lyrics for their next song (the subject of which is always based on ideas the kids deem important); and yet another group at the piano doing vocal warm ups and putting the lyrics to music. The Happiness Club offers its members a safe place to collaborate, hone their skills as performers and create and interact with all kinds of people, helping everyone to understand that they are more alike than they are different.